Does any one know if 9-4x has a rear fog light? I could not find any switch on mine, but I really hope it has it somewhere hidden, one of my favorite features of Saab. Nothing in the manual about it. Does not exist, in USA 9-4X's anyway. I´ve got one 9-4x imported to Sweden 2017 and it was modified (by dealer) just adding a switch on the panel, so I assume it´s prewired for it. I'm kind of surprised that it uses an independent switch (I know this is typical on the 9-3s), and doesn't just activate the rear, and front fog lights off the same switch if the BCM were switched to Euro spec. I of course am assuming that a Euro spec BCM setting even exists on the 9-4X which never managed to officially make it out of the US. I opened my housings tonight. Guess what? The light pods below the reverse lights are fake. Literally nothing in there. Ridiculous. Going to add additional reverse lights though. How bad were they to get open? I've noticed a fair bit of condensation in mine, and I'd like to get them sealed up a bit better before the water kills the electronics. You just used the oven at ~170 for 10 minutes, then pry gently method? No don't bake these, they will probably melt - not like headlights. The outer lens is sonic-welded to the housing. Nearly impossible to separate, although you could probably do it with an expensive ultrasonic knife. I used a hot knife to cut through the rear housing plastic and will melt it back together when done. I'm absolutely dumbfounded that there are fake lights on the 9-4X. Inoperable or inactive, sure. But fake is ridiculous. I can't think of any other car that has fake lights like this. Any thoughts on where all the condensation would be coming from given that the edges shouldn't have any sealing issues like a headlight might? You have condensation on the inner tail lights? Or the main outers? My center LED strip is half failed, and has condensation inside. My rear taillights also have condensation, but no operational concerns yet, so I want to fix the condensation before it starts causing problems. Which tail lights have condensation? The inners or outers? I didn't realize the housing was internally segmented, and just figured that condensation would spread throughout. I am noticing it along the top where the housing runs along the body line of the car towards the front, and also at the top on the back of the car. I haven't noticed it anywhere else lower in the housing. I'll have to look more closely when I get home. Sorry let me clarify. Which of these two do you have condensation in? My rear body mounted lights, and light bar have condensation. The inboard lights mounted on the gate appear to be fine. I plan to open the outboard tail lamps and light bar at some point for repairs. 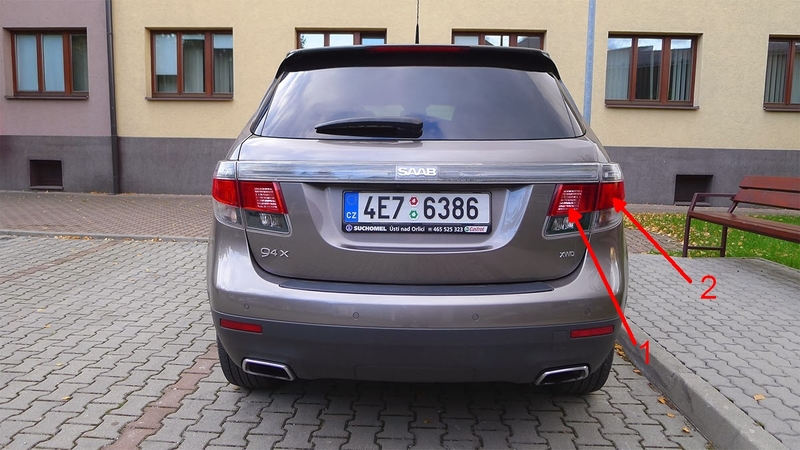 OK - I would advise against trying to open the tail lamps or lamp bar unless you know how saabled.com folks do it (no idea - maybe they have an ultrasonic knife - they're like $400-500). The plastic is welded together and it's super easy to break them - almost all tail lights today are constructed like this vs. headlights which are easy to open by comparison. Hot knife or dremel maybe but getting them back together may look strange once done since you'd be able to see whatever sealant you used. Unless you decide to cut around the back with a dremel and go in from behind, leaving the outer lens to body weld intact, but even that may not get you the access you need and then you have to try and get everything back together perfectly. Do NOT heat the housings up in any way with condensation present - you'll leave water spots on the inside of the housing and then you're screwed.